Professional engine builders are familiar with camshaft walk. Excessive camshaft end play produces erratic spark timing and the movement of the timing chain/gear destroys the timing cover. This problem is resolved with the Moroso wear-resistant cam stop button that mounts in an aluminum holder, which bolts to the cam gear by way of a retaining plate. 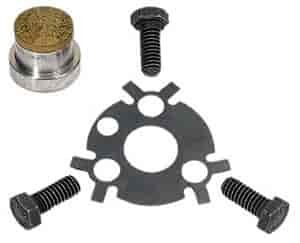 These button assemblies prevent the cam from walking forward, stabilize ignition timing, and protect against engine damage and costly repairs.